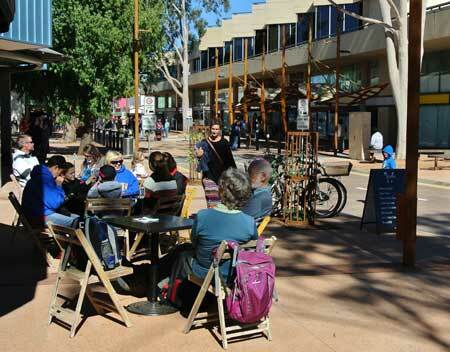 Less than a decade ago extensive community consultations were held to establish direction for revitalising the centre of Alice Springs. Very little of what was put forward at the time has been implemented, including very little of what had the strongest level of support. Left: Todd Street North on one of its better days. Unfortunately that emphasis, on people and activity, dropped from view. The Town Council had been given a bucket of money and wanted to spend it on hard infrastructure, as is the want of governments. There is now widespread local consensus that the ‘bricks and mortar’ changes that emerged out of this process – concluded in 2011 and leading to the creation of Todd Street North and improvements in Parsons Street –have not delivered the enlivening effect sought. This has led to criticism of the works themselves rather than a focus on the missing elements, the “programming” referred to by the design consultants brought in at the time – in other words, activities that attract people, the Something Somewhere film festival being a recent innovative example, the Bangtail Muster, a tried and true one. The council killed off another that was catered for in the works – skateboarding. It has, however, provided better access to power and lighting to support activities – including things as simple as tourists recharging their devices – and has organised successful community events, such as the night markets and the annual Christmas Party. Right: Todd Mall – the benefit of the simple addition of powerpoints. But events alone are too sporadic to deliver the changes the town centre needs. Such changes have already been significantly explored and prioritised. This is not to say they should not be reviewed, but there is surely no need to go back to square one. If the design consultants of 2007-2011 are the people Robyn Lambley MLA refers to as having hijacked the process, not being practical and having “no skin in the game”, she is ignoring the input into the processes they led of scores of local people, passionate and thoughtful and with ‘skin in the game’, whether as business owners or as residents who wanted and needed (still do) a safer, friendlier centre of town. There was wide support at that 2008 forum for having more people live in the CBD, seen as a strategy to solve its “social problems”. This would involve ‘bricks and mortar’ work, of course, but with a guaranteed payoff: nothing would bring people into the CBD more than it being their home. One suggestion at the forum was to offer concessions to this kind of development. No progress whatsoever has been made on this front. The forum heard conflicting ideas around raising the building height limit in town, then 14 metres for three storeys. Some suggested that a proviso for projects in excess of that height could be that the upper levels be used as residences. And others still proposed that such projects be required to address some environmental benefit such as carbon neutrality (zero greenhouse emissions). Left: The most oppressive face of the Supreme Court looming over one of Alice’s best loved communal spaces. Reclaiming the Hartley Street carpark (council-owned land) as a “town commonage” also drew attention at the forum and this proposal has seen some follow-through. It became one of the four future projects identified when priority was given in 2011 to developing Todd Street North. The idea was described as “developing a village green – an event space and meeting place – in the centre of the mall around Flynn Church and Adelaide house, with ‘ripple’ projects for a Spirit of Alice iconic sculpture and a new functional brief for Adelaide House”. 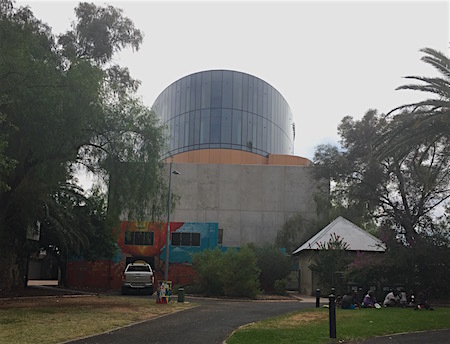 Since then the Town Council and the Uniting Church have developed a joint proposal for a residential and commercial development combined with a community meeting place. They sought funding support from the Federal Government’s Regional Development Infrastructure Fund (2013). This was unsuccessful. They followed up with a bid for NT Government support (2014). Unsuccessful again. Perhaps this time around, with the Chief Minister having put $20m on the table, this proposal will be able to take the next step. However, replacing the lost car parking spaces with a multi-storey carpark was not positively received when we aired Councillor Jamie de Brenni’s thoughts on the matter earlier this year. In the meantime, it is worth recalling from the 2008 forum and subsequent discussions some of the simple inexpensive ideas to improve the liveability of the town – simple, yet largely ignored. • Safety can be delivered by stall-holders – “passive policemen” – on the street after hours. The example from Melbourne was a flower stall. Low rent for the concession was made conditional on the stall staying open late at night, to 10.30pm. Perhaps not be quite the thing in Alice, but what about a coffee cart, or a pancake or noodle stall, or in summer, an icecream stand? Not to forget Alice’s own StoryWall (see photo at bottom), never adequately supported, though it inexpensively drew people to the mall after dark for screenings of a range of programs about the town’s heritage, environment and contemporary life. • Active shop frontages – people outside can see in, people inside can see out – enhance street safety by the same principle (passive surveillance) and add to a feeling of vibrancy. There has been hardly any progress on this front. The Wicked Kneads cafe on the southern corner of the Alice Plaza is a welcome exception. The covered-over windows of the Alice Market on the Plaza’s northern corner are an unnecessary setback. And government has been one of the worst offenders in this regard: look at covered-up frontages of the Tourism Information Office, the Northern Australia Development Office, both in the mall. Government should be leading by example. • “Design a good street and you’ll design a good city” was Professor Rob Adams’ maxim for planning delivered to the 2008 forum. And the simplest way to do that, he said, is to “plant a tree”. The Foundation Tree at the Parsons / Todd intersection became the focus of the subsequent revitalisation works – their most successful feature – yet look at the municipal neglect that has followed. Look at the barren stretch of Gregory Terrace, between Todd Street and Hartley Street where white cedar trees were removed years ago and nothing has been planted in their stead. • “We believe the design that works is the design that conceals itself.” This was the message from Professor Paul Carter. In other words, good urban design doesn’t need to make a huge statement; it can be as simple as creating the right conditions for people moving through town and coming together in the everyday rhythm of life with a sense of well-being – the provision of shade, of seating, of pleasing lighting at night, for example. • Encourage youth into the CBD by having things there for them to do, such as a skatepark. We’ve seen what happened to that idea. And what about little children – where are the play areas for them? There’s nothing like the presence of children to lift and soften the atmosphere and break down barriers. • Create vibrant spaces with public art, well supported by policy. Council has made some progress in this area, but the high point, J9 Stanton’s Recyculator at the tip shop, is a long way from the CBD where the latest public art, the yellow rabbit, is a low point, in terms of the work itself and of council’s abdication from its involvement in the process. 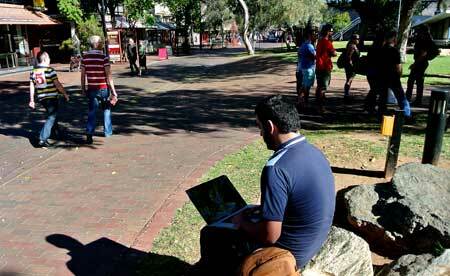 • develop the Snow Kenna Park, across Wills Terrace at the northern end, with a focus on youth. Below: A screening of Jedda on the StoryWall in 2007. Great article and comprehensive coverage of the practical, evidence based and community informed ideas and commitment. A space and place for everyone. Before the Mall there was Todd Street. There were shops selling shoes and clothing, there was also a news agency, a chemist, a pub and even a large local supermarket. In those days, it was hard to find a park as everyone wanted to visit these places. Many blamed the new Mall for driving away these business due to lack of street parking. Shops for locals were replaced with shops for tourists. But tourist season lasts for about just over half a year. I haven’t had a reason to visit Todd Mall for nearly 30 years. I don’t need souvenirs, I have all the Aboriginal art I can fit on my walls and there are coffee shops everywhere around the town. These factors play a part in the loss of the local shopper and visitors wanting things other than souvenirs, but having said that, is it likely that local shops would ever return? Could it be that Malls became passe a long time ago and no one noticed? I know we cant turn back the clock, but young families and youth were in the top end of Todd St before the Ford Plaza, now Alice Plaza. All the community groups such as Family Day Care, Toy Library, Nursing Mothers, Playgroups and many more were housed in the Old Library Building, but that was bulldozed and the groups were spread far and wide across town. Youth went to Shell Todd for their hamburgers and milkshakes and hung out. 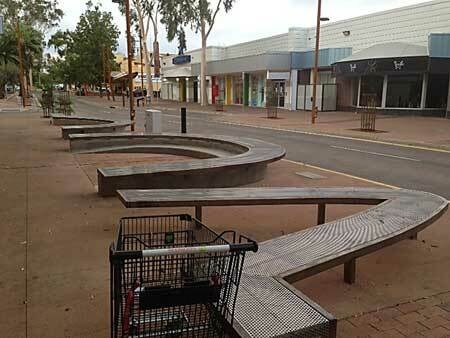 More recently the teenagers were given skate ramp/furniture in the top end of the mall. But then, I think, were told they couldn’t use them. So apart from the markets, which are fantastic and special events, what does take a family to the Mall? ?